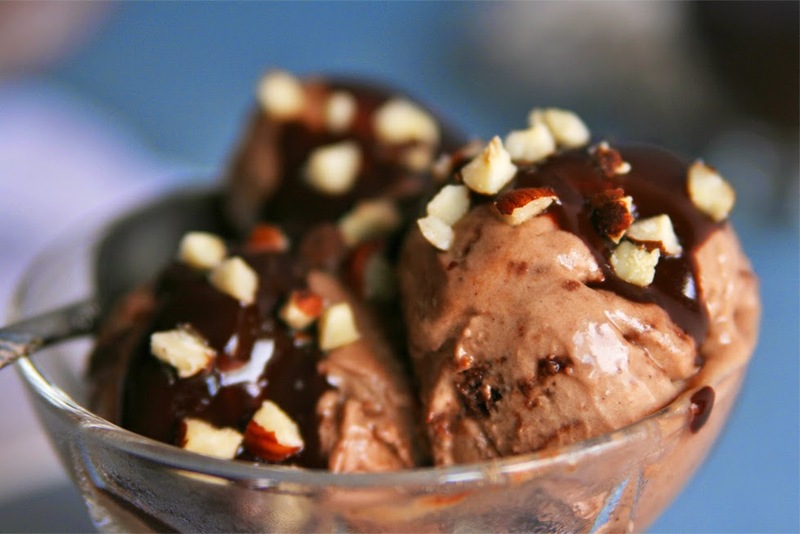 I knew I couldn't let August pass by without an ice cream recipe...and oh boy! 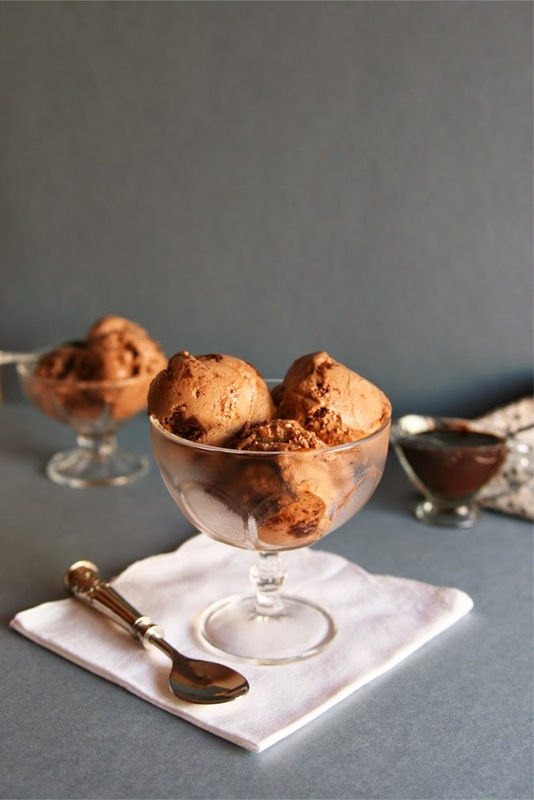 ,this is not your average homemade ice cream, this is, my fellow chocoholics, THE ultimate ice cream recipe! 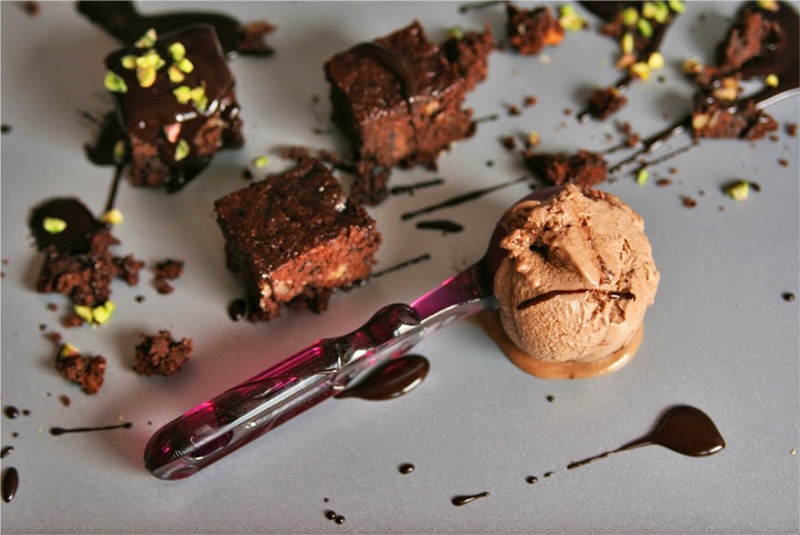 When I posted my Very Fudgy Chocolate Chip Brownies from the cookbook Vegan Chocolate, Fran Costigan (the author of this wonderful book) asked what would I try next and I had no doubt: "Ice cream! ", I answered. My previous attempts at making homemade ice creams resulted in containers full of something looking more close to crushed ice than actual ice cream. But since every single recipe I tried from Fran's book has been a great success I knew this one wouldn't disappoint me. 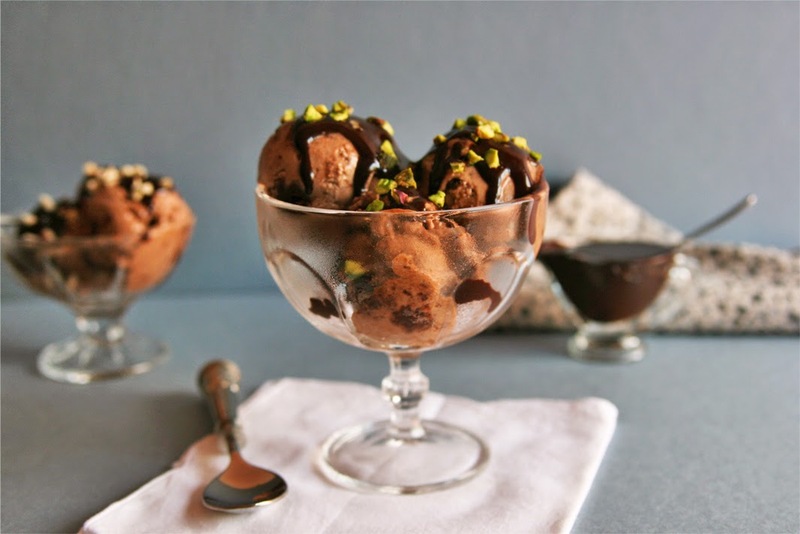 This Vegan Chocolate Brownie Ice Cream has everything you could wish for in a scoop: extremely creamy, flavorful and delicious chocolate ice cream with chunks of very fudgy brownies and a generous drizzle of thick chocolate sauce. You want more? Okay, I bring you two additional add-ins: chopped pistachios and hazelnuts. It's seriously the best chocolate ice cream I've ever tasted, my family loved it and we all concurred in how creamy it was. It's amazing how good a homemade ice cream can taste. I'll make more this weekend cause it was gone in a flash and everybody is asking me for more. Shake off the dust of your old ice cream maker and run to the kitchen, you're still in time to make an amazing ice cream at home before summer ends (but I guarantee you, this one's so good you'll want to make it even in winter). 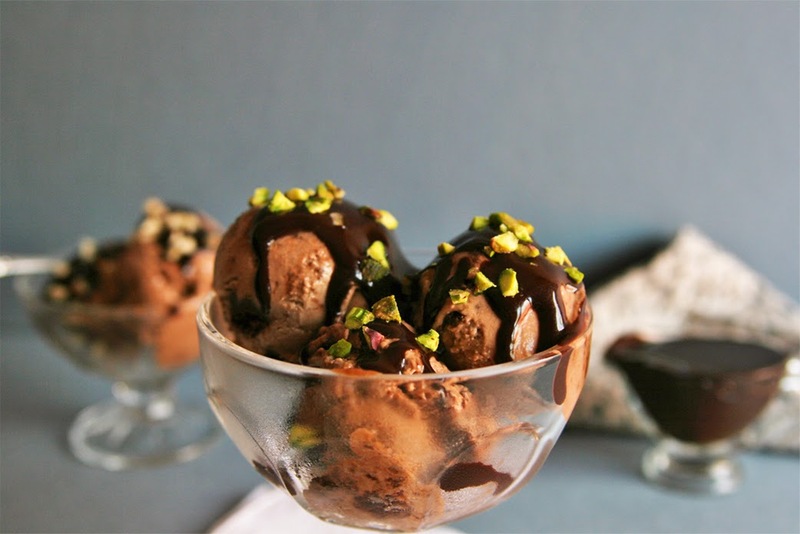 I suggest you to plan ahead this recipe so you'll save time in the kitchen and enjoy this ice cream in less than you think. 2- Make the brownies and the cashew cream. Once the brownie cake is cold freeze until you need to use it. Refrigerate the cashew cream (up to three days). 3- Don't forget to put the churning bowl of your ice cream maker in the freezer. To make sure it's fully chilled I put mine at least 24 hours before using. This always depends on what type of ice cream maker you own. 4- Make the ice cream. 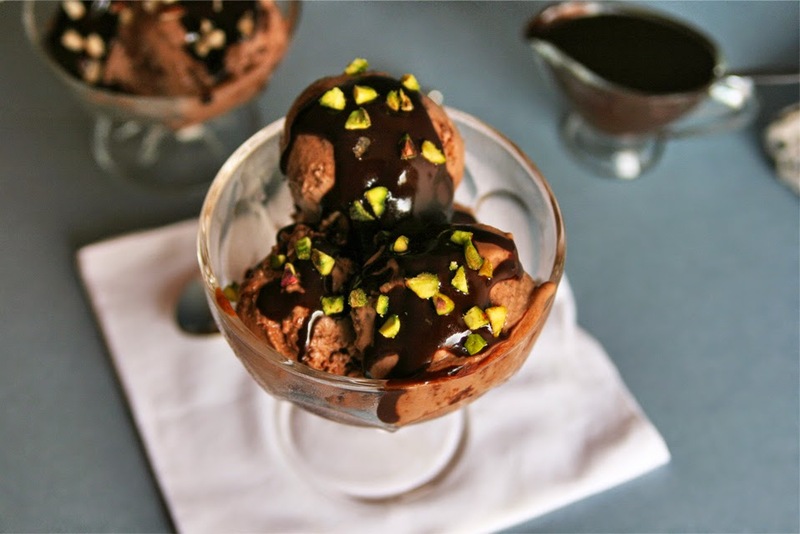 While the ice cream hardens you can prepare a yummy chocolate sauce and some other toppings. 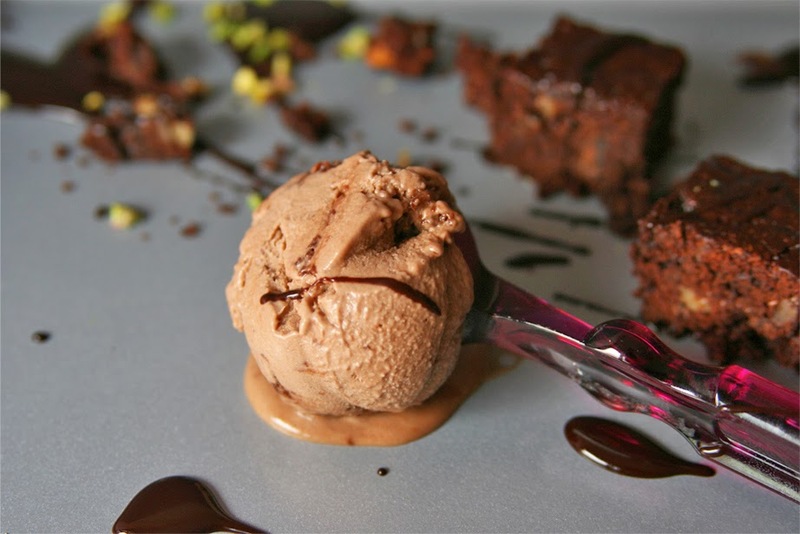 NOTE: one recipe of the Very Fudgy Brownies makes more chunks than you'll need for this ice cream. Keep the leftovers in the freezer until you need them to make more ice cream (I'm pretty sure you'll have enough brownies to make 3 ice creams). 1 1/2 cups cashew cream. 1/4 cup organic granulated sugar. 2 tbsp unsweetened cocoa powder. One pinch of fine sea salt. 1 cup whole raw cashews, rinsed and soaked overnight. 2/3 cup water, room temperature. This basic cashew cream is very easy to make. You just need to put the rinsed cashews into a blender, add the water, maple syrup and vanilla and blend. Gradually increasing the speed, blend for 1 minute until the cream is smooth and no small bits of nuts remain unblended. Add the xanthan gum with caution, making sure it doesn't touch the sides of the blender. Blend on low speed for 30 seconds and increase the speed to high to blend for 1 more minute. Refrigerate until needed. Blend together cashew cream, almond milk, sugar, maple syrup and cocoa powder on high speed until all ingredients are completely combined and the batter is smooth. If you use a blender this will take you only 1 minute. Sprinkle the xanthan gum directly onto the mixture. 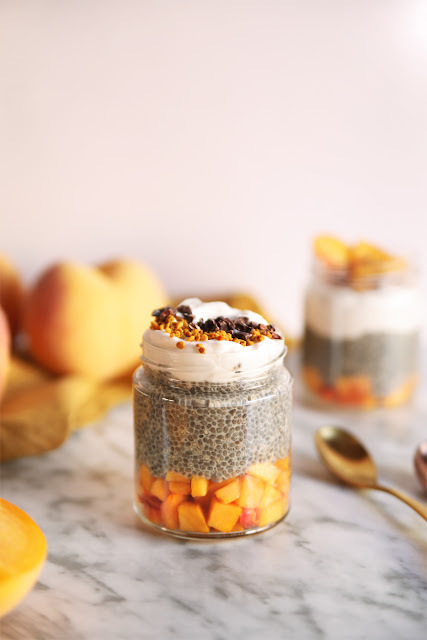 Blend on low speed for 30 seconds to avoid the xanthan gum to go all the way to the sides of the blender and then increase the speed to high. Blend for 1 minute and finally add a small pinch of salt. Pour the ice cream base into a wide flat container (it is important to store it in a flat container to prevent ice crystals from forming, avoid any kind of pints). Cover and refrigerate for 2 to 4 hours approximately until it's completely chilled before churning. The colder (NOT frozen) your base is, the creamier your ice cream will be. Pour the cold mixture into an ice cream maker and churn according to the manufacturer's directions. I churned mine for 30 minutes. 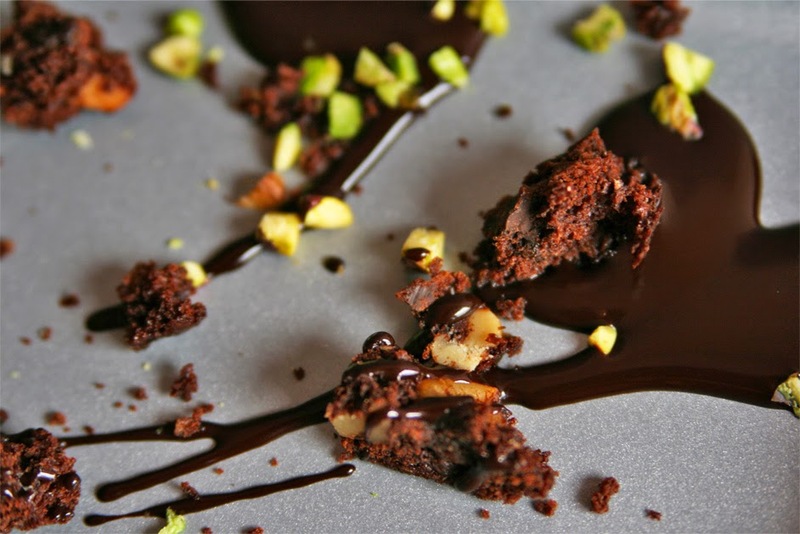 Cut the cold brownies into small pieces and refrigerate again until needed. Add the brownies at the very last minute of churning, this way the chunks won't break. Transfer the ice cream using a silicone spatula to the flat container. Cover and freeze for 1 to 2 hours until the ice cream is hard enough to scoop. 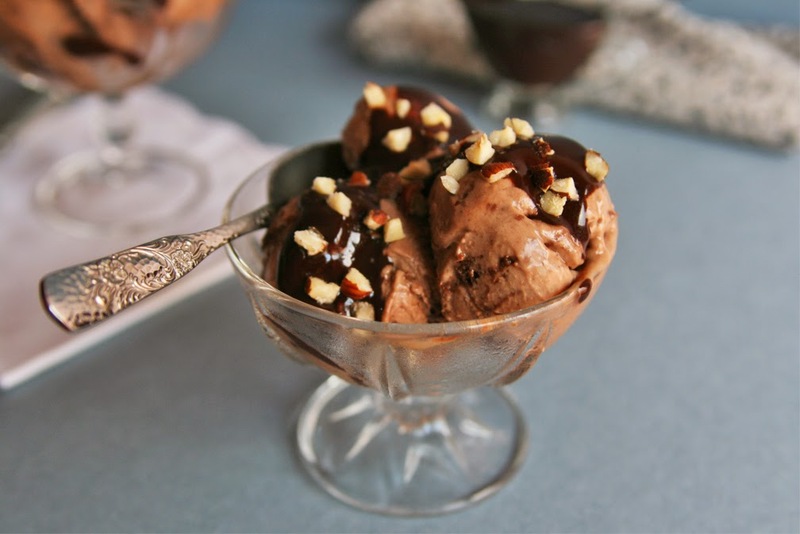 While the ice cream is in the freezer we can prepare some delicious toppings like a thick chocolate sauce to pour over. I made the Thick Fudge Sauce also from the same book (for those of you who have it, the recipe for this chocolate sauce is in the page 277). If you want to make this ice cream look super fancy, chop a small handful of your favorite nuts and sprinkle on top. I chopped raw pistachios and hazelnuts. Simply luscious! 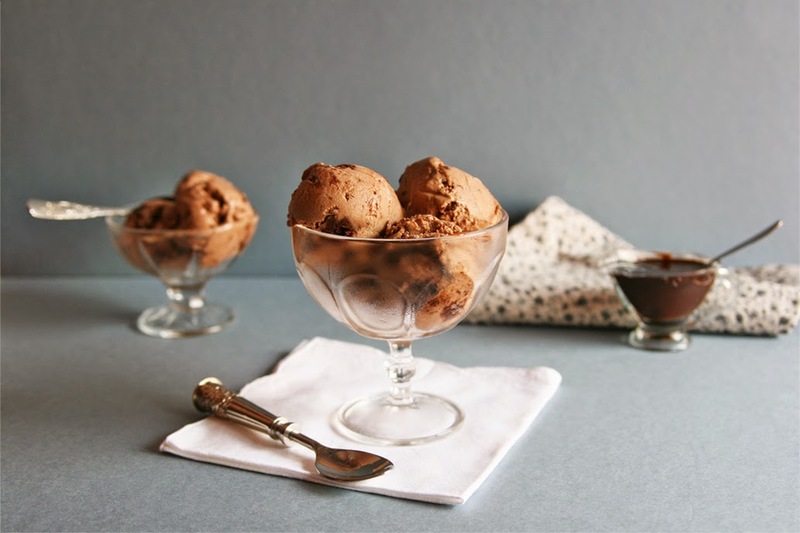 It's hard to beat a rich chocolate ice cream, but chocolate ice cream with whole brownie chunks stirred in? I think that might just top it! Thanks a lot for your comment Hannah! I highly recommend you to try this recipe and if you have some extra time try the thick chocolate sauce too! :-) So yummy!